Pinduoduo stock fell amid concerns about fake and counterfeit listings but has climbed following its first-quarter results. Pinduoduo Inc. (NASDAQ:PDD) stock dipped 14% in August, according to data provided by S&P Global Market Intelligence. 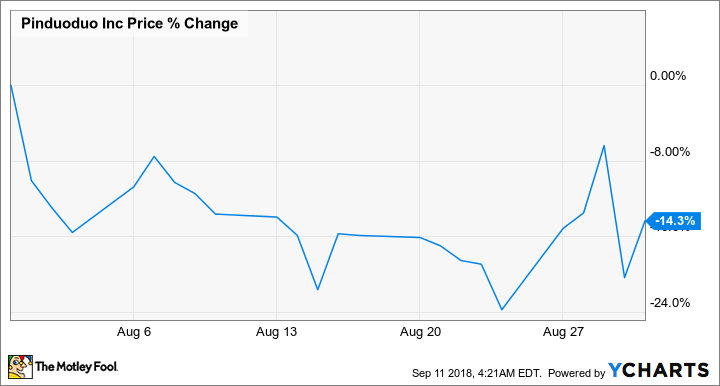 The Chinese e-commerce company had its initial public offering on July 26 with shares priced at roughly $19 and closed out August trading just above that range. Pinduoduo's business hinges around a "social shopping" hook that allows users to team up to buy large purchases in bulk with the aim of getting products at a discount. In addition to the high volatility that's typical of tech IPOs, and Chinese tech IPOs in particular, Pinduoduo stock appears to have seen big swings stemming from concerns about fake listings on its platform and escalating trade tensions between China and America. Shortly after Pinduoduo's IPO, concerns heightened about the prevalence of fake listings and counterfeit goods being sold through the company's platform. To its credit, the company appears to have moved quickly to address this issue -- removing 4.3 million listings from Aug. 2 through Aug. 9. 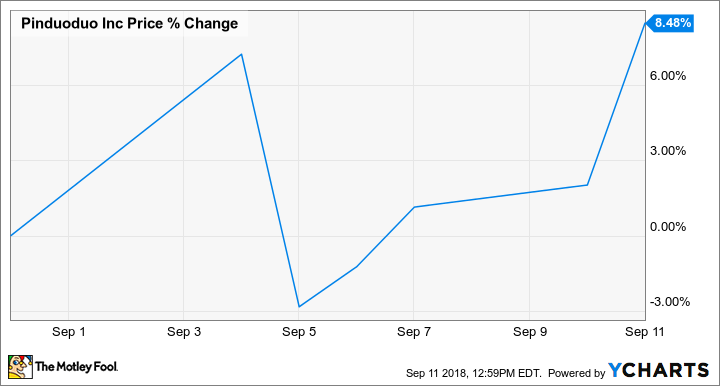 The stock closed out July up roughly 18% from its IPO price despite no substantial news, so a quick reversal isn't exactly unexpected. Pinduoduo reported first-quarter earnings on Aug. 30 and has seen shares rebound following the results. The company posted a $0.20 loss per American depositary share in its first quarter, but there was plenty of good news as well. Gross merchandise volume conducted through the platform over the trailing 12-month period was up 583% to reach $39.6 billion, second-quarter sales were up nearly 2,500% to reach roughly $409 million, and average monthly active users climbed 495% over the prior-year quarter to hit 195 million. Pinduoduo stock has regained ground in September, with shares trading up roughly 8.5% in the month as of this writing. While the company isn't profitable, it's growing at an incredible rate and has the potential to continue benefiting from ongoing tailwinds in the Middle Kingdom's online retail space. Investors should proceed with the understanding that Pinduoduo is a high-risk stock, but it's one that's worth keeping an eye on for those interested in China's fast-growing e-commerce market.